The 1963 Shelby Cobra was a high- performance sports car developed by Carroll Shelby. The light weight A.C. Ace Roadster, which is a British sports car, and has been fitted with a powerful Ford V8 engine. The first Cobra was produced in 1962, and was painted yellow for the race it initially raced in 1962. The original had a 260 cubic inch V8 Ford engine. The 1963 Shelby Cobra was upgraded to include a 289 cubic inch engine. The Shelby was also equipped with a solid- lifter cam, an 11 to 1 compression ratio, a four – barrel carburetor, and the 289 V8 engine put out 271 HP, at 6,000 RPM. 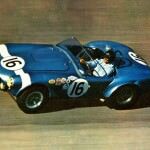 The 1963 Shelby Cobra was entered into the 24 Hours of Le Mans endurance race, and 2 cars were entered into the race. One of the drivers was Carroll Shelby, in which he placed 7th in the 24 hour race. Dan Gurney who raced in the Bridgehampton 500 KM race driving the 1963 Shelby Cobra, and was the first American to win an FIA race, with an American made car. This was the first race won in an American car, which paved the way for future cars to come into the racing circuit. The 1963 Shelby Cobra was first advertised to have speeds of up to 150 miles per hour, but at a test drive by “MotorTrend,” topped out at 130 MPH. The Cobra was able to complete a quarter mile in just 13 seconds, at 112 MPH. It can go from 0 to 60 MPH in just 5.8 seconds. When originally introduced the 1963 Shelby Cobra cost just under $6,000, and from 1963 to 1965 655 Cobras were produced and sold. However, in March of 2006, the 1963 Shelby Cobra which placed 7th in the Le Mans race was sold for $1.65 million dollars. The average value of the Cobras which were produced in 1963 average anywhere from $300,000 to $1.65 million. Yet, the most noticeable cars, which were driven in races when first produced have been valued at up to $2.2 million dollars.